The flour of green banana is a special powder of high-nutritious fruit, rich in minerals and fibers, and contains a starch. In itself it is gluten-free. Its main feature is the content of RS2 (resistant starch) whose absorption in the body and the effect on metabolism differs from other types of starches. 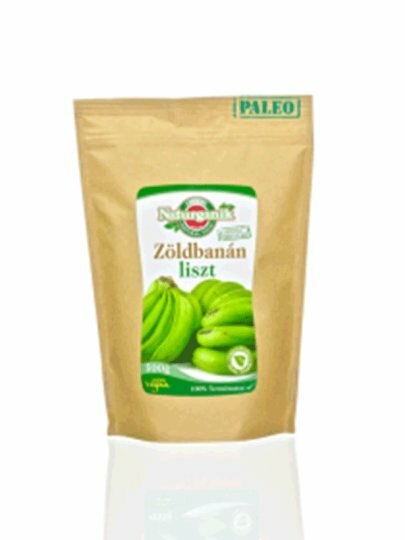 The flour of green banana is a new generation of flour in paleo diet and replaces meal flour in the diet of patients with autoimmune disease who are not recommended to consume them. The flour of green banana is a good source of potassium, magnesium and iron. In addition to common use, it can be well mixed with other seeds, possibly cereal flours, roasted vegetable and tuber flours. It is an excellent addition to various oatmeat and baby food, can be successfully used to thicken soups and sauces. The product is manufactured in a place where cereals, soy, nuts, celery, mustard, sesame seeds are packed.